We often like to highlight our “common sense business person’s approach” to investing. We are contrarian by nature and focus on the leading businesses in areas that are out of favour, facing change, or are depressed in the near term. Since the launch of our Concentrated Global Share Fund in 2016, no industry sector represented this better than the old media pay television space in the US. The sector serves as an interesting case study on the merits of buying quality assets at or below their replacement value. We have all read the doom and gloom about “cord cutting” and millennials preferring Netflix over traditional cable and satellite services. But what some may not be aware of is the rich hunting ground this industry has been for our Fund, with two takeover offers within the last year. When we launched the Fund, our thesis was clear: Pay TV content channels need to consolidate as scale is becoming more and more important. 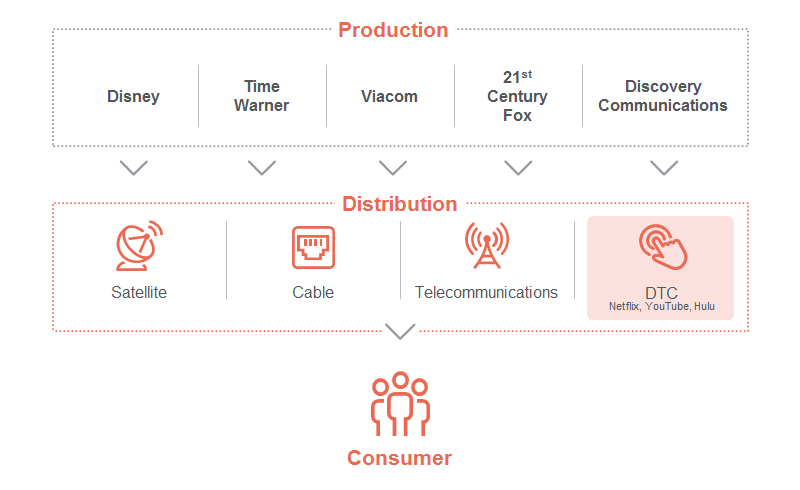 The value chain of the media industry below highlights the shifting balance of power between the content generators and distribution platforms to the consumer, with the Direct-to-Consumer (DTC) paradigm providing opportunities for the content producers to encroach on the platform territory and better target content to the end consumer’s preferences. Historically, consumers paid a premium to access bundled channel content through distributors. With the DTC model and disruptors like Netflix and YouTube coming to the fore, the distributors are progressively dismantling their ‘fat’ bundles to offer ‘skinny’ packages that are more tailored and competitively priced. This dynamic naturally has implications for the content generators, which is playing out through a wave of merger and acquisition activity. Media value chain – content is king! This consolidation dynamic is true not just in television but across many sectors. We have witnessed significant consolidation themes play out over the past two decades across different industries which we have held in our portfolios. But what has remained constant is our focus on identifying unique, high quality assets and then having the patience to let our thesis play out. This is the core foundation of our contrarian philosophy. At the time of our Fund launch we only held one investment in Media, being Time Warner Inc. (TWX). We loved Time Warner’s unique asset base, with one of the world’s leading news channels (CNN) and premium drama content via HBO. It was no wonder that in July 2014 Rupert Murdoch tried to purchase the business but was rebuffed. Time Warner is more than just CNN and HBO, the company has a suite of fully scripted channels that include TBS, TNT Sports, Cartoon Network, and a blockbuster movie studio centred on the Warner Bros and DC Comics franchise. In October 2016 AT&T made a $107.50 share offer for Time Warner which valued Time Warner shares at a multiple of 19.5 times (x) its 2016 earnings per share and a 12.4x enterprise value multiple (EV/EBITDA). The consideration was an equal proportion of shares and cash representing a premium of 40% to the prevailing share price at the time. On completion, Time Warner shareholders would own 15% of the combined company. Following the bid, we used the strength in the stock price to sell our entire position in Time Warner. We believed the bid fully valued Time Warner and also held the view that AT&T could face an uphill battle with the Department of Justice (DOJ) Antitrust division to obtain requisite approval for the merger. As an aside, the DOJ has recently filed to stop the bid and now it is heading to the courts for resolution. The proceeds we realised from the sale of Time Warner were redeployed into 21st Century Fox. This is a common theme in our Fund whereby we look to realise investments that have reached their intrinsic value. We then look for other opportunities within the industry with similar unique premium assets that are hard or impossible to replicate and are trading below their replacement or build value. 21st Century Fox (“Fox”) fit that criteria and we invested. Consistent with our prior media investments, we place considerable value on the Fox assets. The company was formed through the spin-off of News Corporation’s publishing assets in 2013 and operates a broad collection of businesses across cable network programming, filmed entertainment, television, and Direct Broadcast and Satellite TV. The company’s television assets are primarily focused on news and sports content, together with entertainment programming through FX Networks and non-fiction science and exploration content through the National Geographic channel. The prime assets of the company are its Fox News and regional sports networks, which hold leading positions in their categories in North America. Outside of its home region, Sky Plc holds the number one position in the UK; Star India distributes content through over 40 channels across India and more than 100 other countries; and National Geographic is a global leader in its space, reaching over 440 million homes in 171 countries and broadcasting in 45 languages. Fast forward to December 2017 and another stalwart of the media world, Disney, launches a bid to buy the majority of Fox’s assets in an all-stock transaction for US$66.1 billion (A$88.0 billion) including debt of $13.7 billion. The deal represents an 11.9x calendar 2018 EV/EBITDA valuation for the assets sold, leading the stock to rally more than 40% from its recent November 2017 low. The assets to be sold include Fox’s Film and TV studio, FX Networks, National Geographic, Fox Sports Region Networks, Fox Networks Group International, Star India and Fox’s interests in Hulu, Sky, Tata Sky and Endemol Shine. Prior to acquisition, Fox will spin-off its remaining assets into “New Fox” including the Fox Broadcast Networks and TV Stations, Fox News Channel, Fox Business Network, FS1, FS2 and the Big 10 Network. Following the Disney bid we reviewed our thesis and decided once again to use the strength in the stock price to sell our whole position in Fox. We believed the bid fully valued the business and longer term, we believe that New Fox, which will be effectively run by Rupert and Lachlan Murdoch, will merge this entity into News Corp’s newspaper businesses. We believe that such an entity does not represent a premium unique asset as newspapers today are a highly commoditised business, heavily disrupted by digital formats and have little or no pricing power. The sale represented an average holding period gross return of 18.5% (before fees and taxes) for our investors. The realised proceeds from the sale were once again redeployed into the sector, this time Discovery Communications (DISCA) was the recipient. Discovery operates a portfolio of premium non-fiction, lifestyle, sports and kids programming brands. Content is distributed to more than three billion cumulative viewers across pay-TV and free-to-air platforms in more than 220 countries and territories through highly recognised and endorsed channels. We have been closely following Discovery Communications for some time as it also offers a unique set of assets, difficult to replicate and occupies the number one position within the non sport male demographic within the US pay television market. The company has engendered some strong leadership positions in distinct segments, such as the Oprah Winfrey-lead OWN Network with a strong following within the female African American demographic, and Europe-focused sports programming and broadcasting through its Eurosport business. 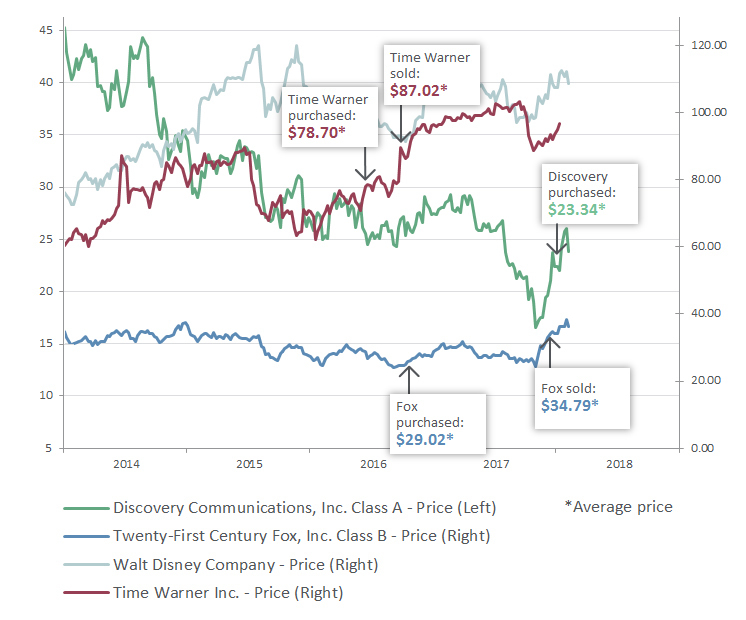 Apart from Discovery’s unique content, its share market valuation is compelling. Discovery Communication trades at a current PE of 9x, has significant excess depreciation and trades on an 8x 2018 EV/EBITDA, which represents a 50% discount to the two most recent private market takeover prices. Additionally, the synergy benefits from their recent acquisition of Scripps Network, which operates the HGTV, Food Network and Travel Channel subscription offerings, would represent an additional 15% of their total cost base and contribute double-digit earnings over time. We believe there are no competitors capable of replicating their library or asset base at such extreme valuations, even though we do acknowledge that it does face headwinds with consumers cancelling subscriptions and becoming more selective about the content for which they pay. They are losing traditional pay television subscribers and need to get into a ‘skinny’ lower priced bundle package. But beyond the short term, we believe if you have superior content, media companies will go direct to the consumer, similar to what Netflix have done with their original “House of Cards” content. Part of our investment philosophy is to look for businesses that have an owner-operator management mentality. They are in tune with commercial and operational facets of the company and hold significant financial stakes in its success. John Malone — a pioneer in the US cable business and the largest owner of US private land — is Chairman of Discovery’s board and is its former CEO and founder. Malone has visibly backed his convictions through doubling his stake in Discovery in December, increasing his share in Discovery by 30% to become the largest individual shareholder. His combined stake in the company is now worth in the vicinity of US$400 million. Malone’s position clearly fits our criteria which adds to our conviction in Discovery. It is still too early to speculate how the remaining assets in the media landscape will play out, but it is obvious to us that superior content will increasingly be delivered direct to consumers via an app on multiple devices, and failing this, takeovers will increase over the coming decade. Viacom will most likely merge back with CBS and Discovery may find a home with a larger content provider. Ultimately, the cable distribution providers are likely to converge with the telecommunications providers as 5G spectrum deployment quickens. Across our investments in media content generators, a common rationale for the purchase decisions was the ability to buy these assets at prices below the replacement value of their content library. “[Discovery] have good brand recognition globally and he owns all of his content. He doesn’t just license it, he actually creates it, produces it and owns it, all rights in all markets”. We have bought different viewership segments that are leaders within their category and have allowed the time for their value to be appreciated. Our latest investment in Discovery Communications continues that theme. It is a leader in the non-fiction 18-40 year viewership bracket and despite its below-par valuation, is generating a return on equity of over 130%. We recognise the intrinsic value of the growing content library which, once created, becomes an asset that can be syndicated through other platforms or via DTC approaches to generate additional revenues for little further outlay. The same dynamic doesn’t apply to the platform providers who are increasingly reliant on the content kings. Ashley Pittard shares his team's thoughts on investing in China through Macau's leisure and entertainment industry, with insights into the Chinese Government's broader agenda for the island.